Yogurt is made by fermenting many types of milk -- including whole, skim, and evaporated milk -- with lactic acid bacteria. These beneficial bacteria are usually from the types called lactobacillus bulgaricus and Streptococcus thermophilus. Depending on how yogurt is made, the resulting product can have different flavors and textures, and contain different strains of good bacteria. Yogurt is generally known as a "live" food, because it contains living micro-organisms that exist naturally in the human gut. Some of these microscopic bacteria are good for human health -- these are known as probiotics. The good bacteria most commonly used as probiotics are lactic acid bacteria, such as lactobacillus and bifidobacterium. Not all yogurt contains probiotics, however; some live yogurt contains bacteria that are neither harmful, nor beneficial. Other types of yogurt are heated in such a way that all live cultures are killed. Lactobacillus is a broad name for one type, or genus, of bacteria. The many species of lactobacillus are found naturally in our digestive and urinary tracts, and also in fermented foods such as yogurt. Yogurt is most commonly made with lactobacillus bulgaricus, lactobacillus acidophilus, L. animalis and L. casei. Bifidobacterium are a type of good bacteria found naturally in healthy gastrointestinal systems, and also in fermented foods such as yogurt. 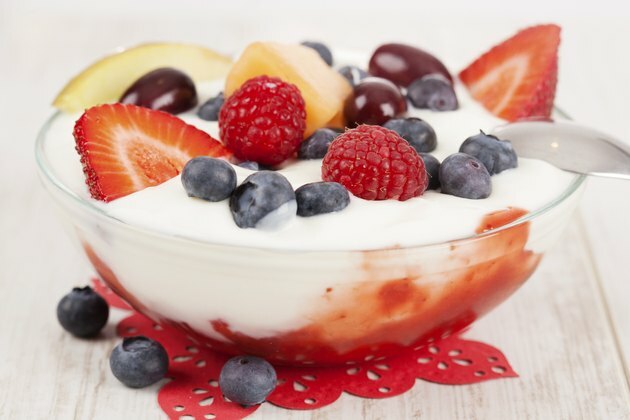 Some commercial yogurts feature the probiotic Bifidobacterium strains B. animalis and B. lactis. Another type of starter bacteria used to make yogurt is Streptococcus thermophilus. It is widely used in the production of yogurt and cheese. As with lactobacillus and bifidobacterium, there are many species and sub-strains of Streptococcus thermophilus. At least 81 types of Streptococcus thermophilus can been found in commercial yogurts and cheeses. Not all yogurt contains live, beneficial bacteria, and many yogurts sold in supermarkets do not. To help consumers determine which yogurts contain live, active cultures, the National Yogurt Association established a “Live Active Culture” seal, which is used on packaging of yogurt that contains a certain level of lactic acid bacteria. Even if you don't see the seal on your carton of yogurt, check the ingredient label for the presence of live bacteria. Applied and Environmental Microbiology: Detection and Classification of Streptococcus Thermophilus Bacteriophages Isolated from Industrial Milk Fermentation.